Winter can be tough on your car. Winter elements take a toll on your car which is why winter preparation is crucial. Being prepared can make all the difference when something goes wrong while traveling on a cold winter day. Here’s a handy checklist to get your car ready for winter. Cold temperatures wreak havoc on batteries because they slow the chemical reaction inside of the battery. If your battery is older, have it tested and possibly replaced. A dead battery is the last thing you need on a cold winter day. Make sure the heater and defroster are in good working condition. The ability to see through the windows and drive safely is crucial in winter weather. Being unable to see out your car windows creates unsafe driving conditions. Wiper blades crack and split over time resulting in blades that don't perform well. Change your wiper blades to winterize your car. You should also replace your windshield wiper fluid with windshield wiper fluid formulated for winter conditions. Good tires are essential for the wet, icy, snowy road conditions that winter weather brings. Check the tread on your tires. Not having an adequate amount of tread makes slippery roads even more dangerous. Colder temperatures cause tires to deflate. Want to know why? Read TPMS blog. Check your tire pressure for proper inflation periodically throughout winter. Refer to your owner’s manual for the manufacturer’s recommendations for proper inflation. Whether you’re a seasoned veteran or a new driver on icy roads, it’s in your best interest to have a winter emergency kit in your car. If you break down, get into an accident or stuck in snow being prepared will make things a lot easier. 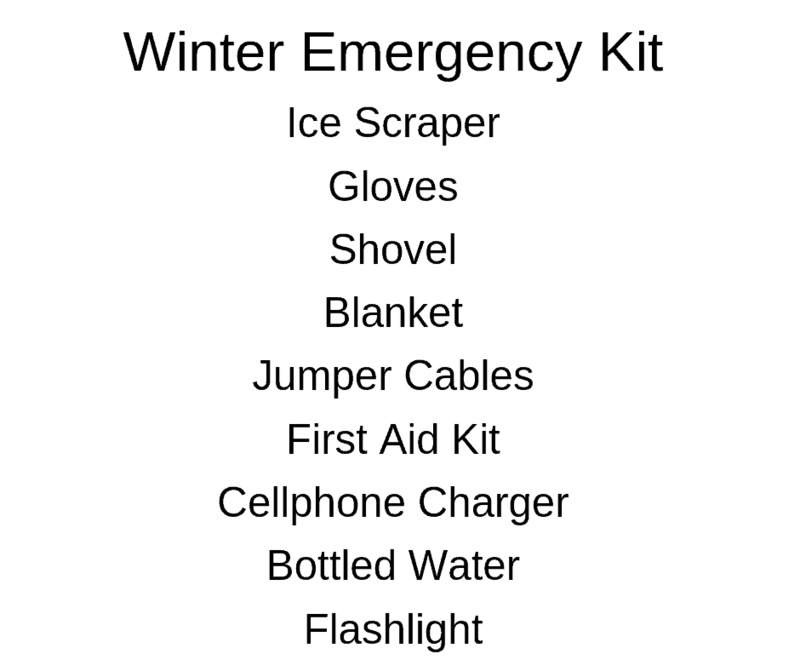 Check out the list below for some important things to put in a winter emergency kit. Keep your gas tank above the ¼ mark. If it’s cloudy or snowing, turn your vehicle’s headlights on. While it may not improve your visibility, it will, however, alert other drivers of your position. Don't use cruise control on icy or wet roads. Never drive with snow on your hood or roof. Give yourself more space than normal from the vehicle in front of you. If you begin skidding, don’t panic. Calmly and slowly turn the steering wheel in the direction opposite of where you’re facing. Don’t apply the brakes—just let the tires find traction. Contact Star Auto Sales service department for your vehicles winter maintenance and get your car ready for the coldest days. Star Auto service technicians have the training, equipment, and experience to prepare your car to take on the elements.